I am as brown as brown can be, And my eyes as black as sloe; I am as brisk as brisk can be, And wild as forest doe. (The Child Ballads, 295) So begins a beautiful tale of love, loss and revenge. Following the seasons, A Pocketful of Crows balances youth and age, wisdom and passion and draws on nature and folklore to weave a stunning modern mythology around a nameless wild girl. Only love could draw her into the world of named, tamed things. And it seems only revenge will be powerful enough to let her escape. Beautifully illustrated by (TBC), this is a stunning and original modern fairytale. 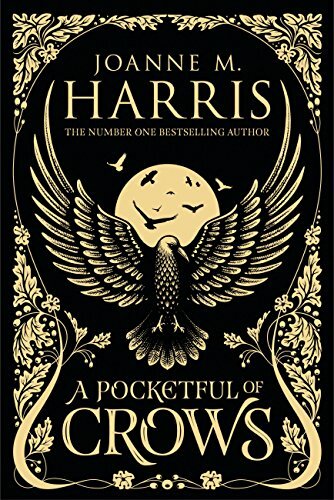 I confess I wasn’t really sure what sort of a book a Pocketful of Crows, by Joanne M Harris (also known as Joanne Harris), was nor whether it was my sort of book. I very quickly discovered it was my sort of book even if I don’t recall reading anything quite like it before. It’s inspired by, and takes its story from, “The Brown Girl” which is one of the Child Ballads. While these were collected together in the 19th century they are far older than that. This and the other ballads are essentially old folk tales a number of which have become folk songs. It is about a wild girl, unnamed, who lives in the woods and falls in love. She calls herself a traveller. Depending which version of the ballad you look at there is a maximum of 16 four line verses. To transfer that into this book seems remarkably creative. It weaves myth, legend and folk stories into a tale about love over the course of one year. The sheer richness of the narrative is wonderful, covering love and hate, the seasons and the wild things. For me it also asks if the wild can be tamed and what happens then; is madness a possibility. The writing is really beautiful – poetic and magical. It also gives a real sense of time and place while being timeless and unbound. I don’t recall reading anything quite like this before. It manages to be light and dark and compelling and engaging and much more all at the same time. I guess I’m not absolutely sure who the target audience is. However if it appeals to you, I think you are the target and you should enjoy this wonderfully rich tale. I rarely re-read books these days – this one may well be an exception. I was simply blown away by this and would love to read another from this author if it was anything like this.